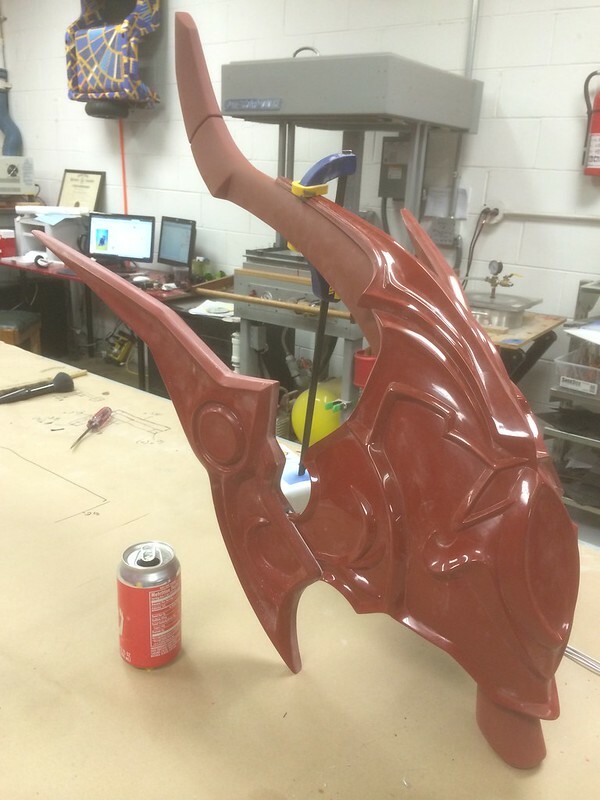 In terms of scale, Garuda’s Spine is the largest prop I’ve built to date. 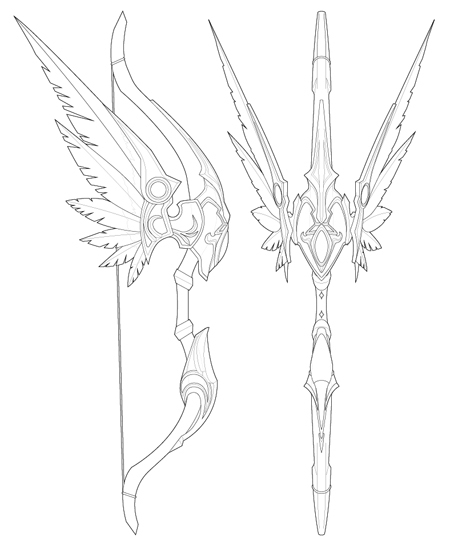 The weapon itself is everything that epitomizes the world of JRPG excess: a seven-foot tall bow fitted with a shield crest and 40″ long fold out wings. 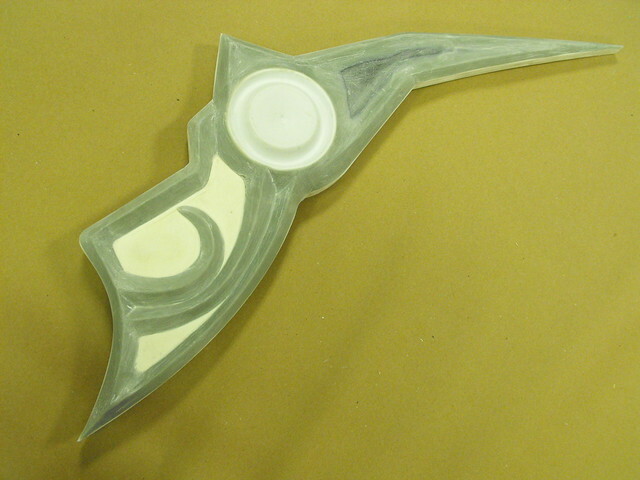 The finished piece was intended for use with cosplay, and therefore had to be built as lightweight as possible. My client gave me the luxury of an extended timeframe, and I really buried myself in the details of this piece. I wanted it to be perfect, with a degree of finish that some might consider unhealthy. This was going to be my best work yet. Starting off, I made the bow 85% scale to true game size. Even for a 5′ tall client, the bow would be nearly 7’4″ in overall height and the massive wingspan wouldn’t fit through doors. 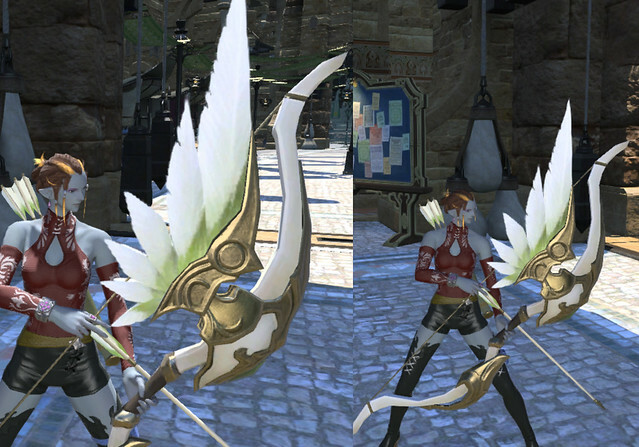 At 6’5″ the bow is still imposing but far more manageable. 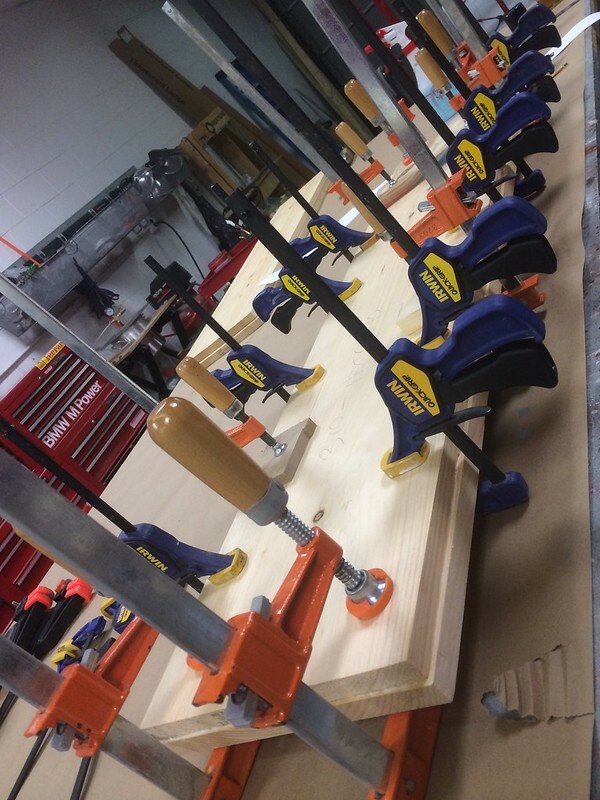 The first step was to make a set of blueprints to reference during production. I pulled a lot of screenshots both from the game itself as well as the FFXIV model viewer. 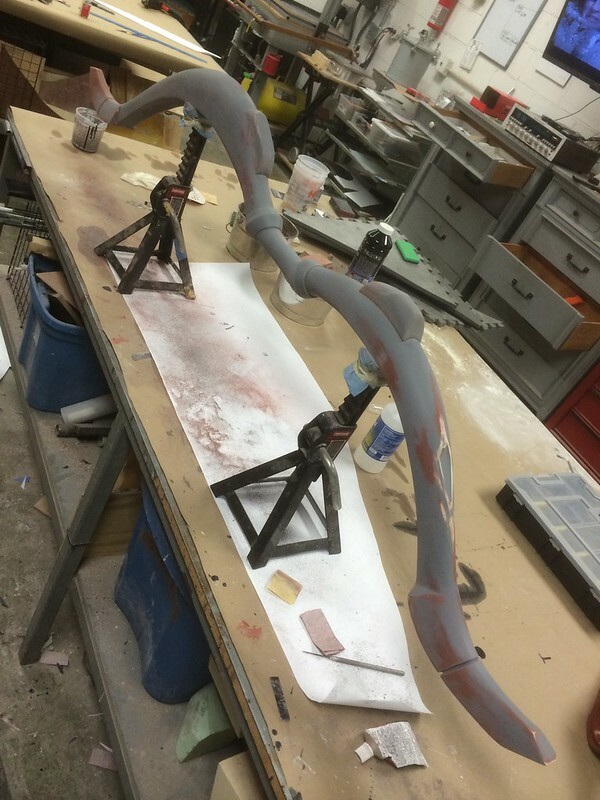 The massive limbs would be upwards of 4″ thick in some places, and needed a very large piece of stock to sculpt from. 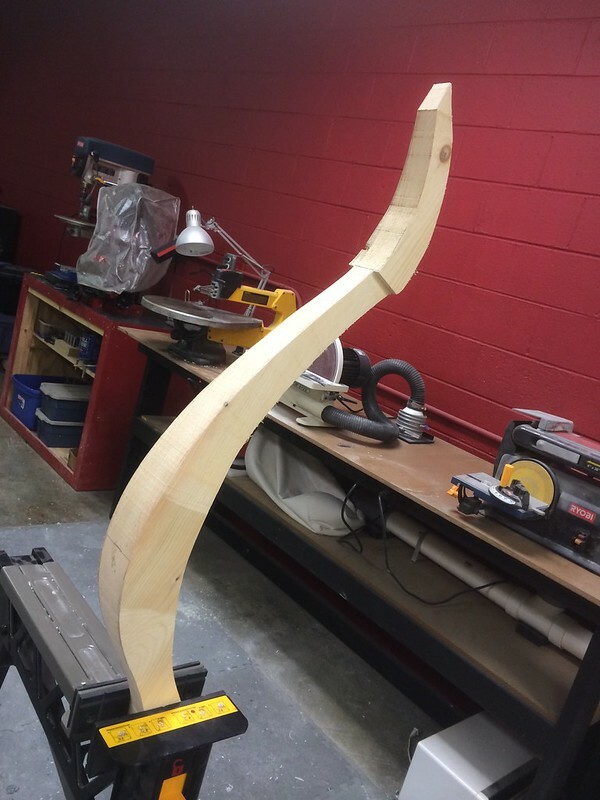 I laminated several sheets of 1″ poplar together to create a giant slab, then rough cut the bow limb shapes out on my bandsaw. 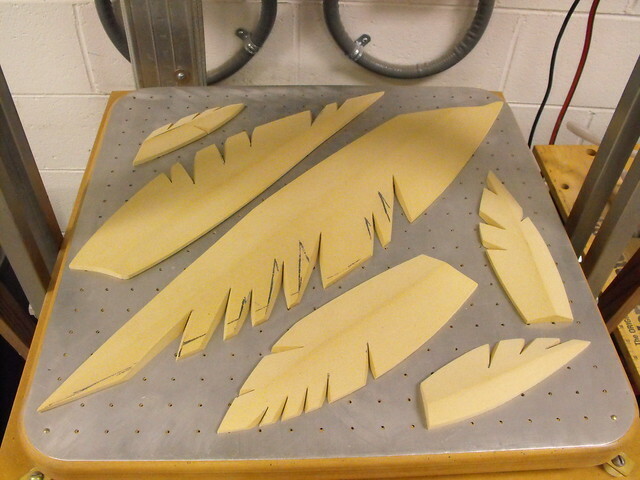 These were then trimmed down to shape using an air grinder and a chisel drum bit to remove large chunks of material. 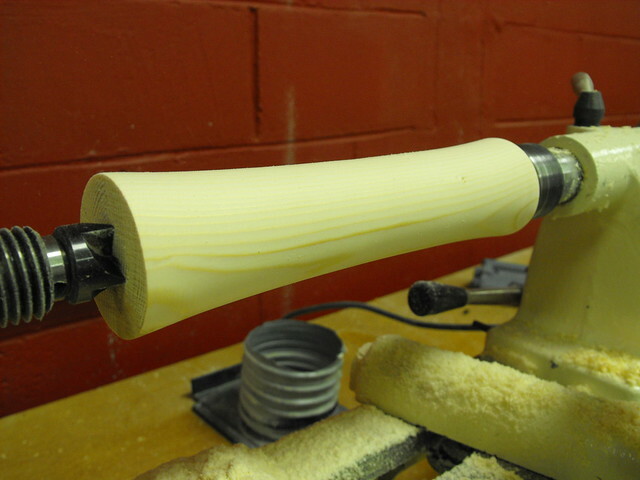 I swapped this out for a sanding drum, then eventually hand rasps and sandpaper. 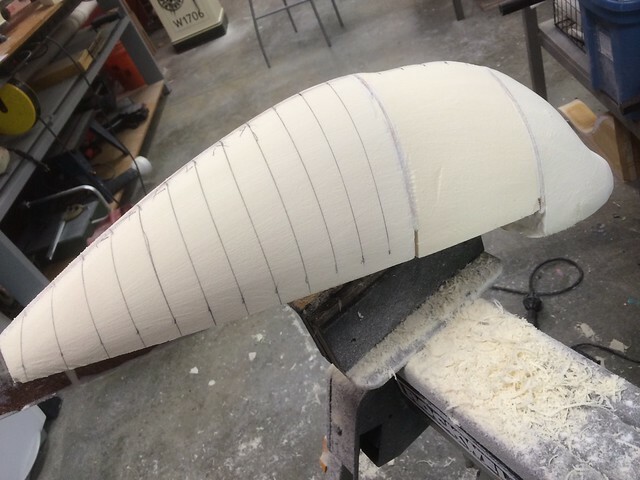 The interior of the bow limbs didn’t have much detail in-game, so I added a recessed channel along the back side to keep the shape from looking too flat. 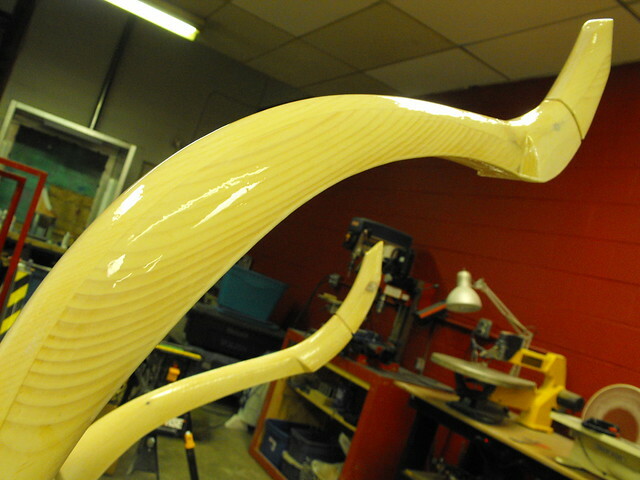 At the same time, the handle between the limbs was turned from a scrap block of laminated poplar. 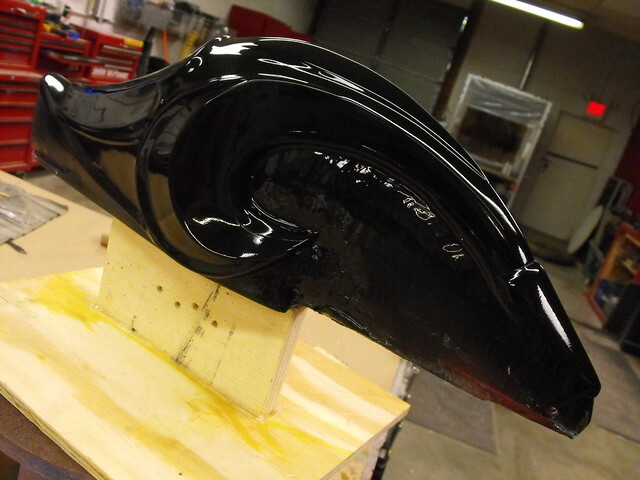 With the shapes complete, urethane resin was brushed over the wood to seal it in prep for sanding and paint. 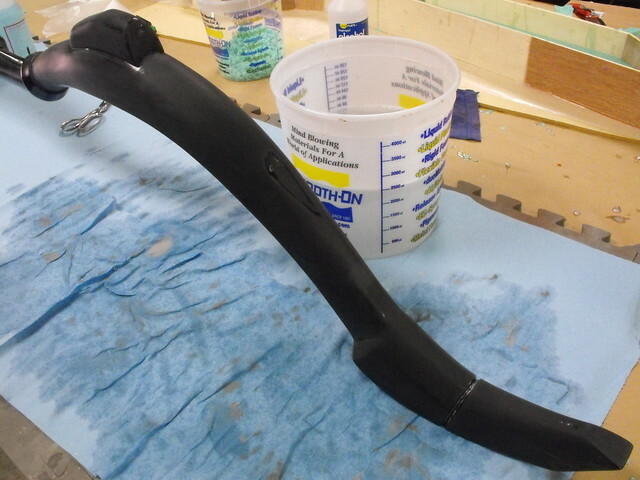 This plastic coating ensured the wood wouldn’t swell or crack during the painting and moldmaking process to come. 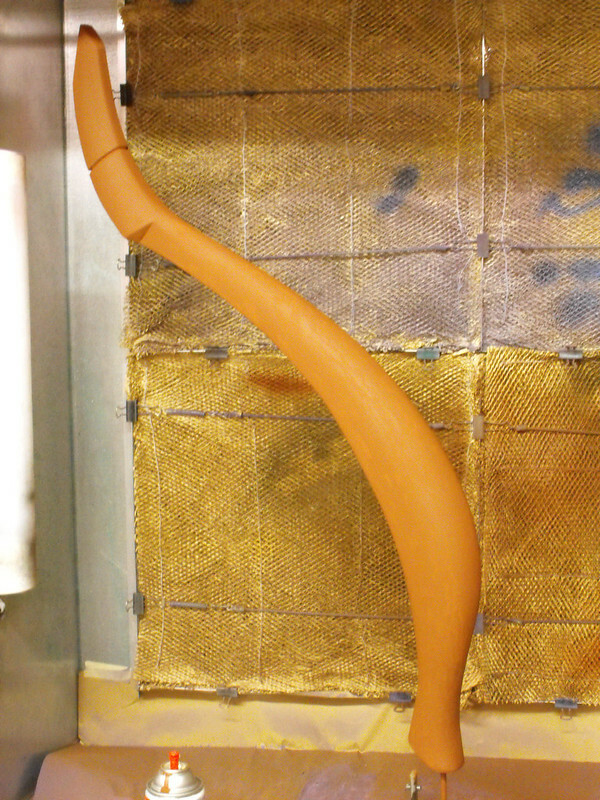 Scale on these things is somewhat lost in the photography, so here’s just the upper limb in my spray booth. 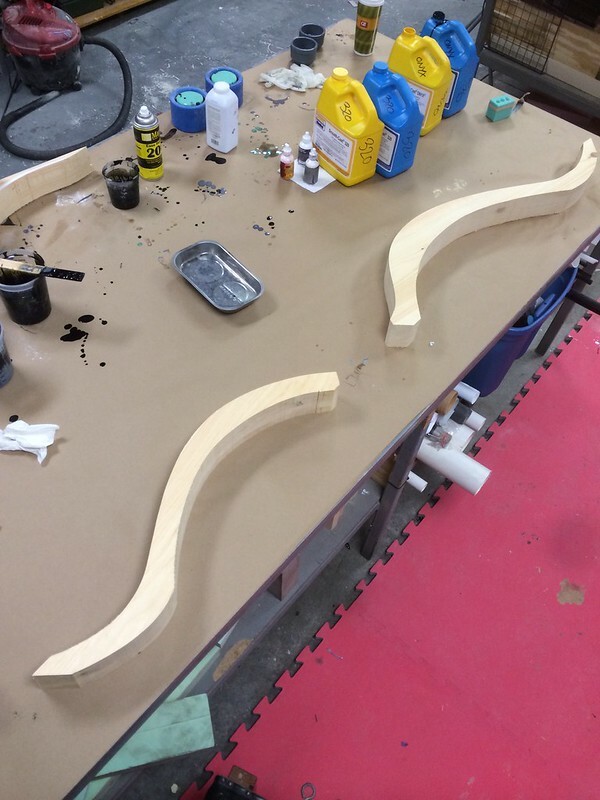 The overall interior dimension of my booth is 4′ square, and this is just one half of the bow. It barely fit. 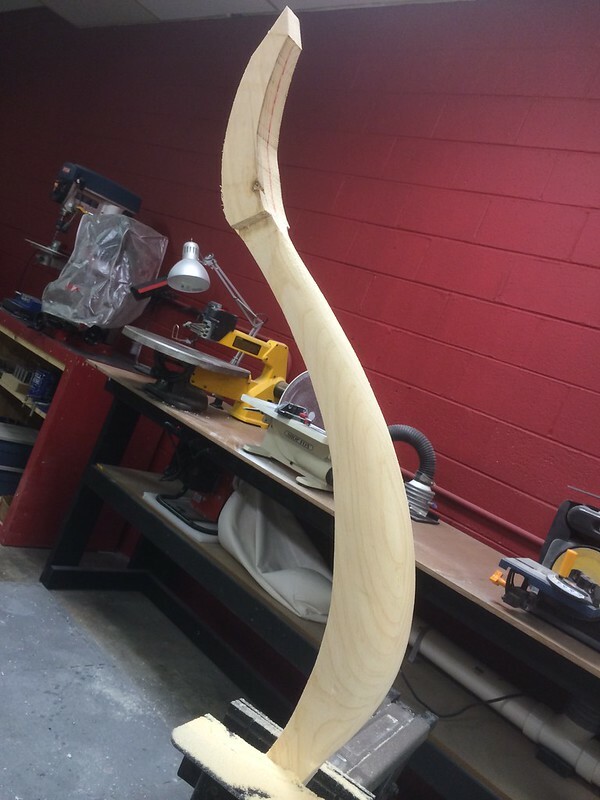 After beveling the handle on the top and bottom, it was secured to the limbs with a wooden dowel. 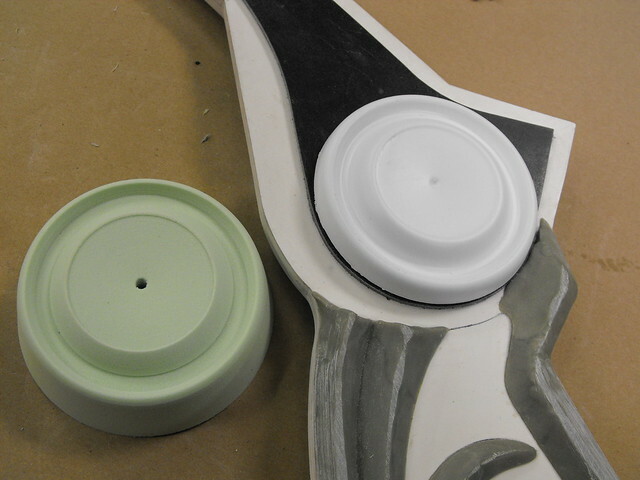 The intersections were built up with apoxie sculpt into the beveled rings seen below. I’m posting the progress on this slightly out of order to follow the build path of each individual component. 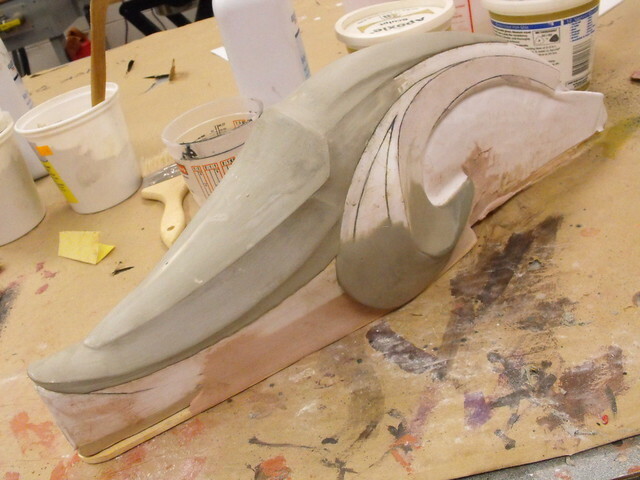 Chronologically, the upper and lower crests for the bow had been sculpted and cast at this point, and I used those castings to create a set of standoff blocks fitted to the bow limbs that would properly hold the crests in place. 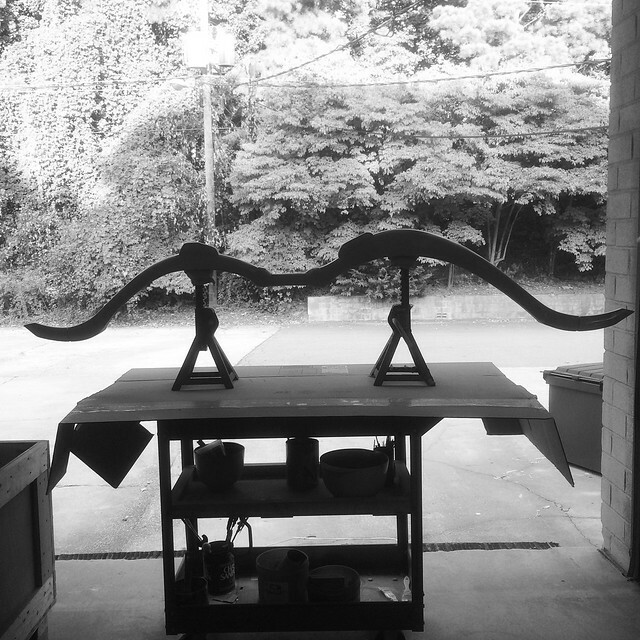 Making the limbs one piece meant the bow could no longer fit in my spray booth, and the remainder of the paint work was completed with the limbs balanced on a pair of jack stands off the end of my loading dock. 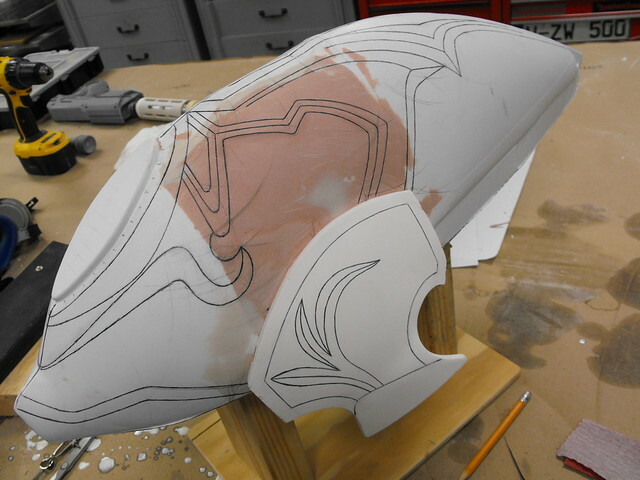 First passes of primer revealed some areas that needed filler and sanding to get properly smooth. 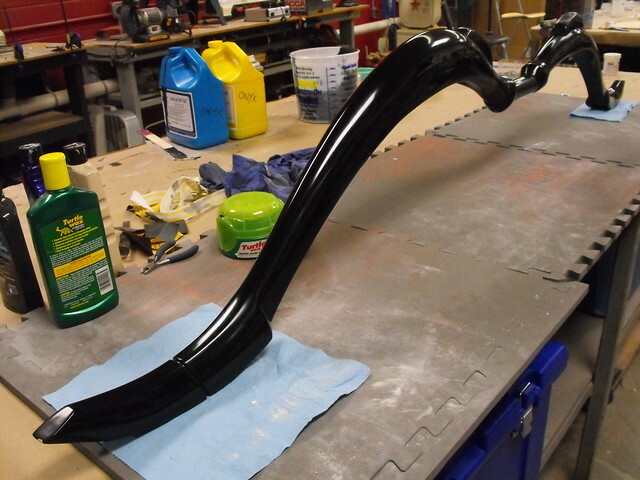 After a lot of sanding, the primer coat was ready for paint. Last stage of prep involved sanding the entire bow surface with a super fine sanding sponge then cleaning the surface with wax and grease remover. 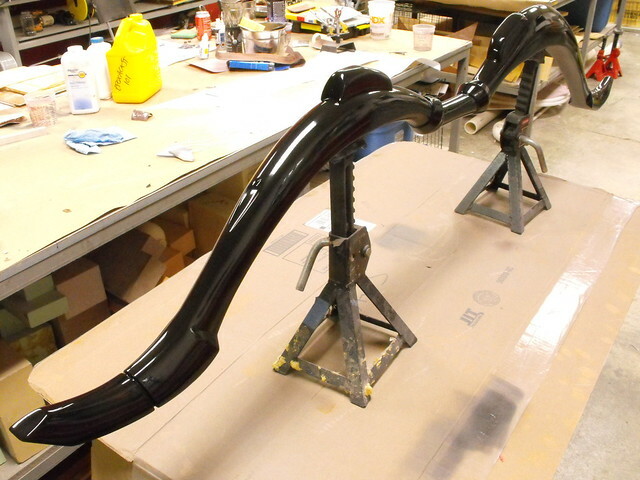 In order to spot surface variations more easily the limbs were painted with gloss black. 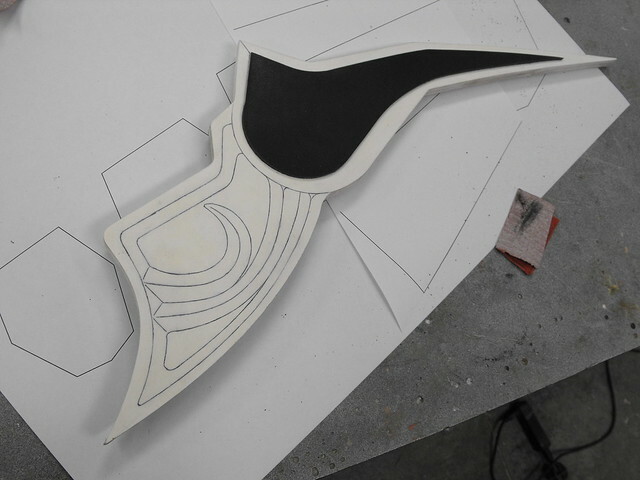 Since I had to wait 24 hours for one side of the bow to dry before I could flip it over and paint the opposite side, this process took a while. Painting in multiple stages like that meant the finished product had some lumpy over spray in some parts, which meant it was time for wet sanding. Wooooooooo. 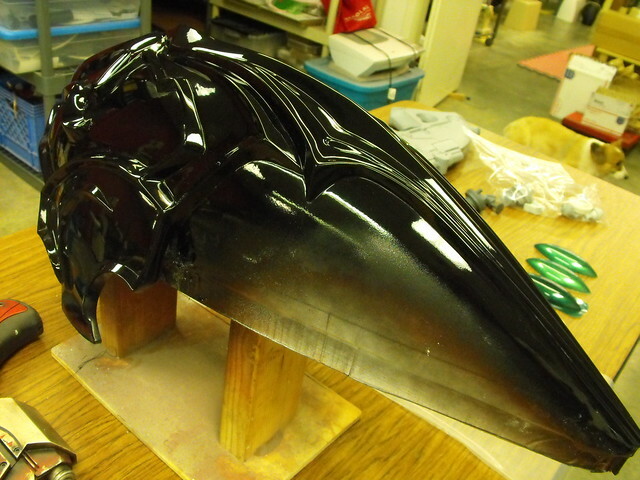 I started with 600 grit and eventually worked through 1000, 1500 and 2000 grit before rubbing compound and wax. The finished result was very sleek. 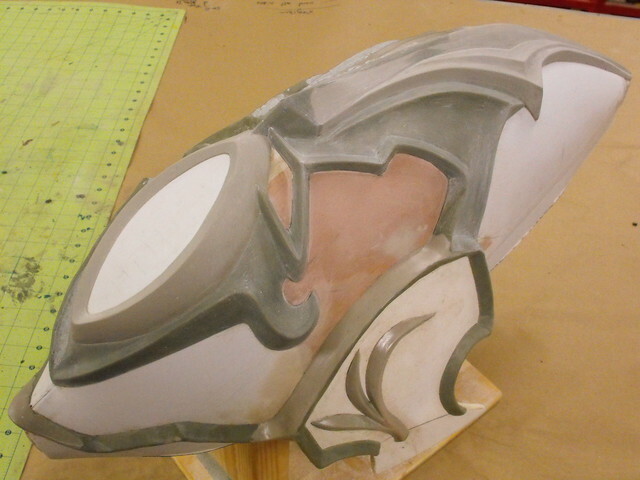 For the upper crest, I went back to my “3D slice and foam filled cavity” method of sculpting employed on many of my helmet projects. 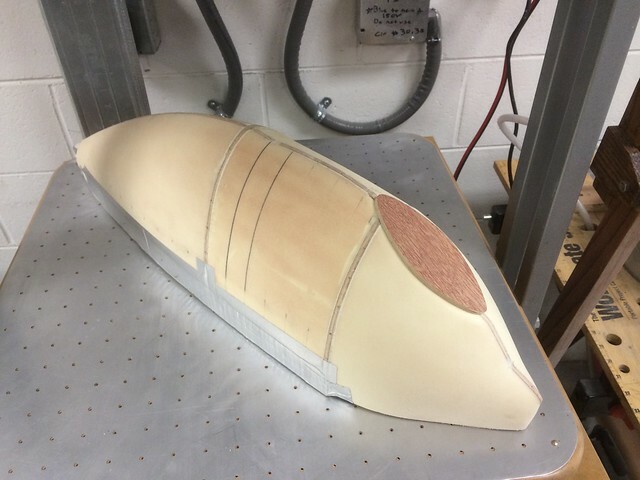 The base form is an internal skeleton made up of cross sections of the overall shape. 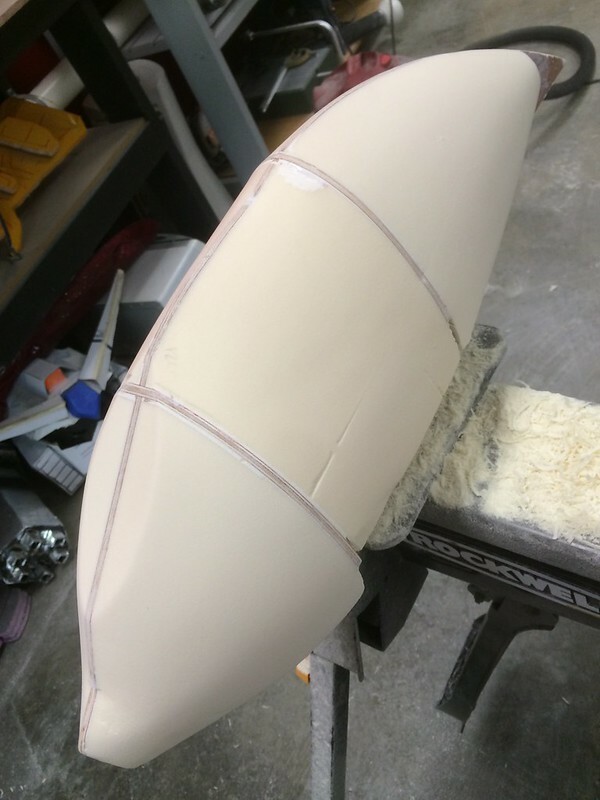 The space between is filled with urethane tooling foam, then sanded down to shape using the internal frames as sculpting guides. 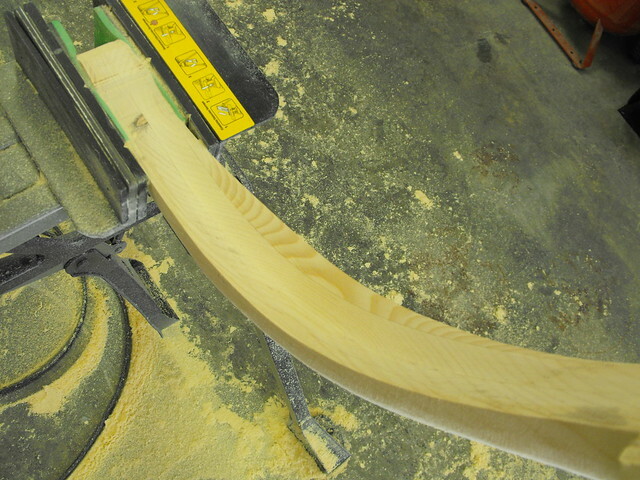 I use a rasp and heavy grit sandpaper to get the base shape complete. 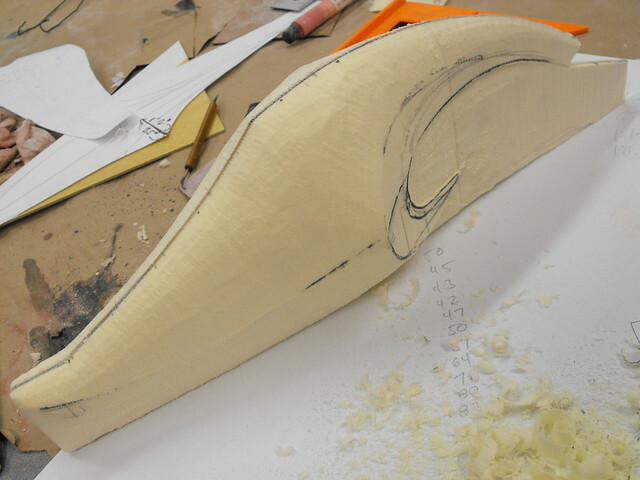 For this part I also added some reference lines so I could measure the curve with a contour gauge and make sure both parts were symmetrical. 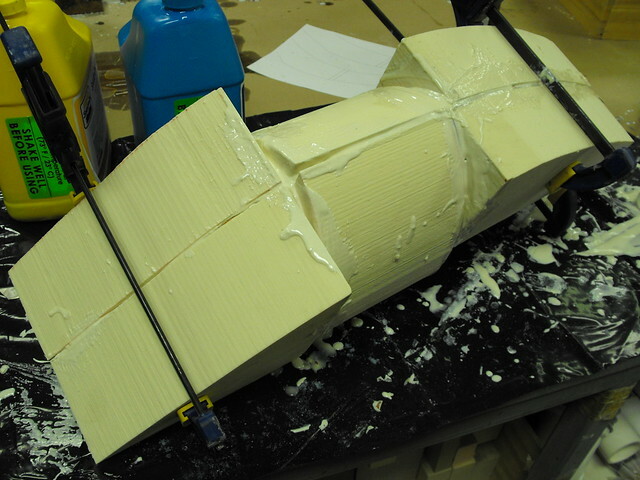 The foam is very fragile on its own, so I tossed the whole part under my vacuum former in order to give it a more robust shell for sculpting and paint. 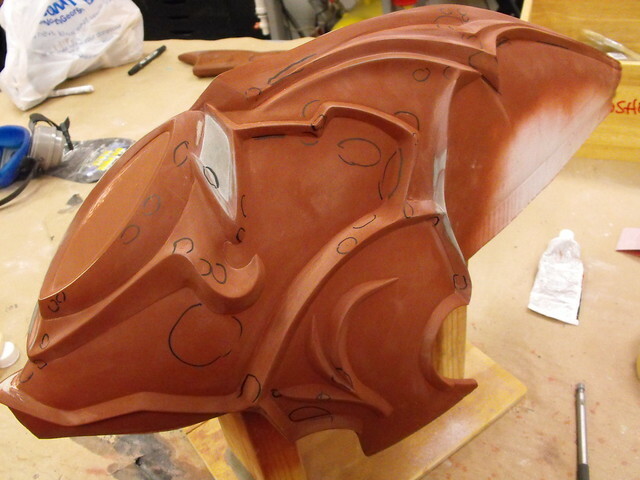 After filling in some low parts with bondo, the filigree pattern on the upper crest was transferred from the blueprints to the 3D form using a compass, calipers and curved ruler. This. Took. Forever. 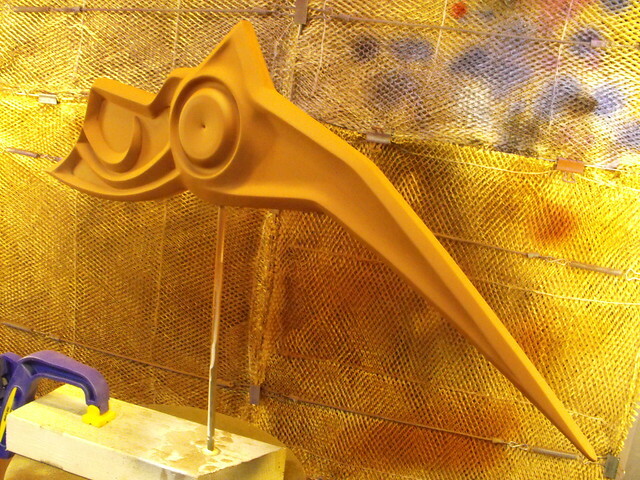 Also added at this point were the two smaller “wing holders” that would eventually mount to the gold base parts holding the feathers on either side of the bow. 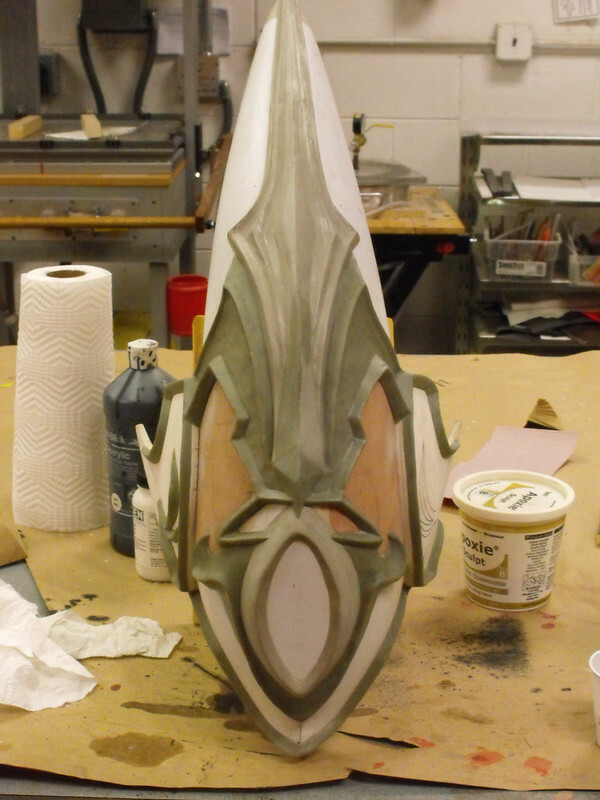 I took my time sculpting the filigree parts, making sure each section was symmetrical and cured before moving on to a new part. Mostly these were done in Apoxie Sculpt but I also tried out Smooth-On’s Free Form Sculpt in a few areas. If you’re interested in the contrast between the two materials you can see my comparison on them right here. 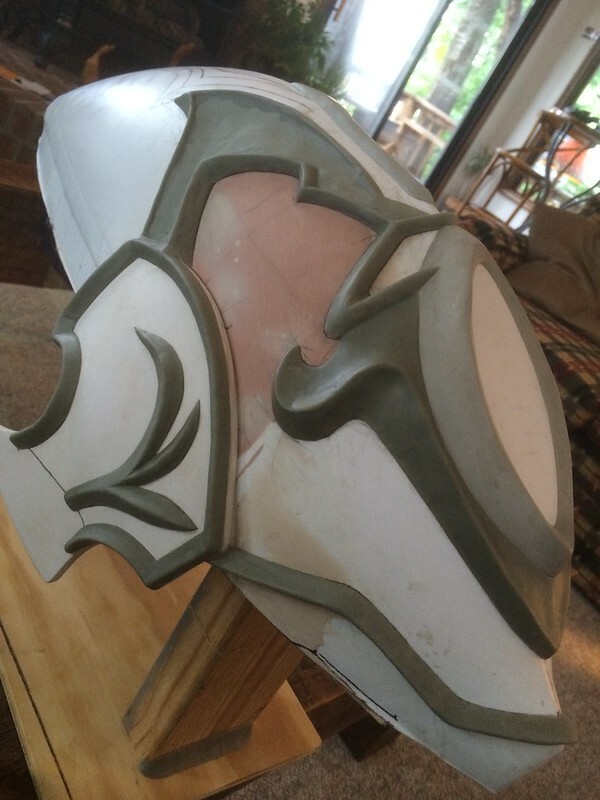 As with everything, much sanding was needed to get my rough sculpts perfectly smooth. Apoxie sands very well but it’s also incredibly dense, so this also took forever. 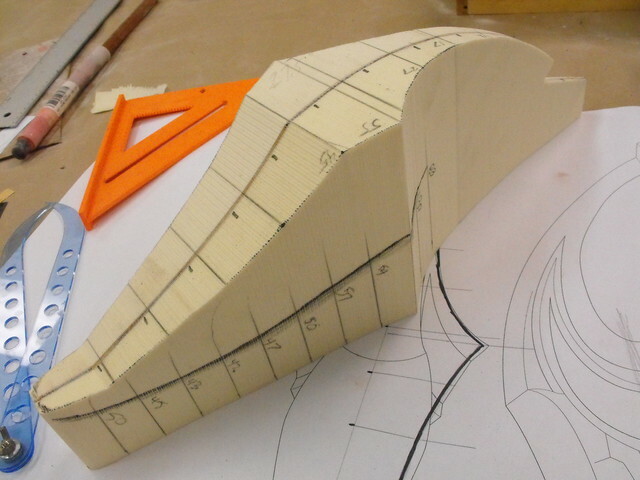 I spent lots of time with needle files making sure each recessed angle was crisp and even. 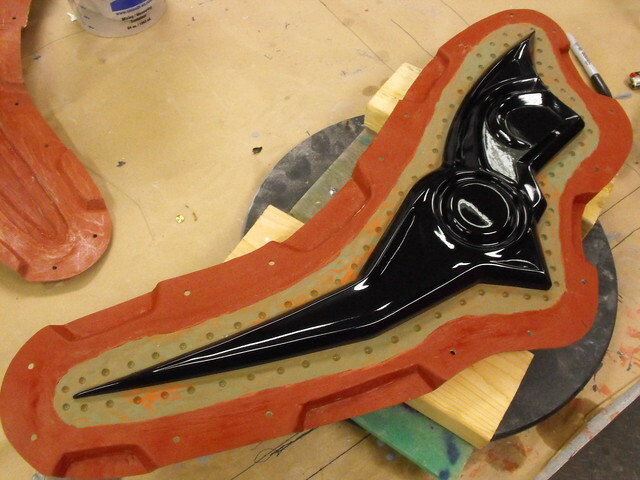 Sanding and filling complete, the upper crest was painted in gloss black and was now ready for moldmaking! 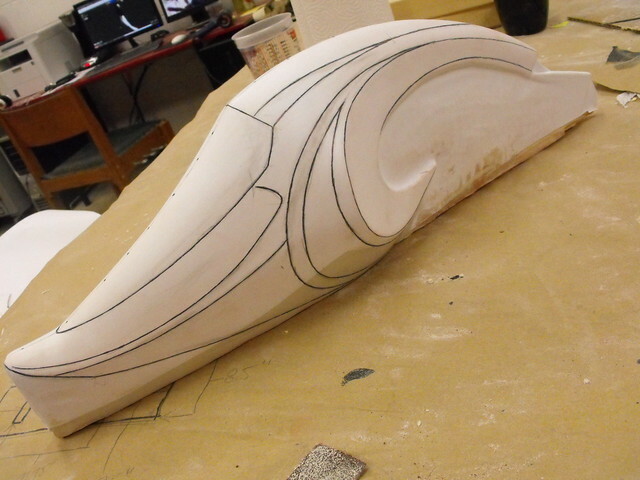 Sculpting the lower crest followed a similar pattern – cross section with urethane foam first. 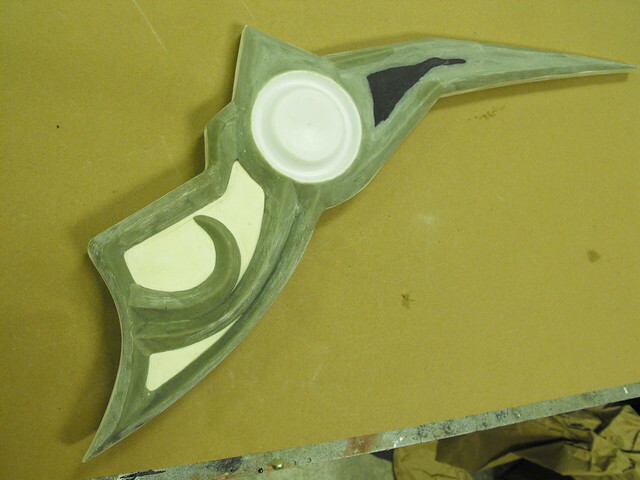 I used bladed clay sculpting hoops to get the recessed areas a bit more crisp on this particular piece. 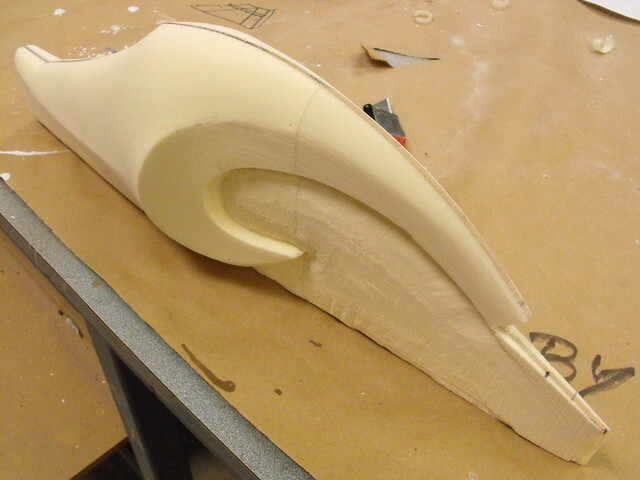 This was then vacuum formed under white styrene for rigidity before tracing the filigree pattern onto the surface. 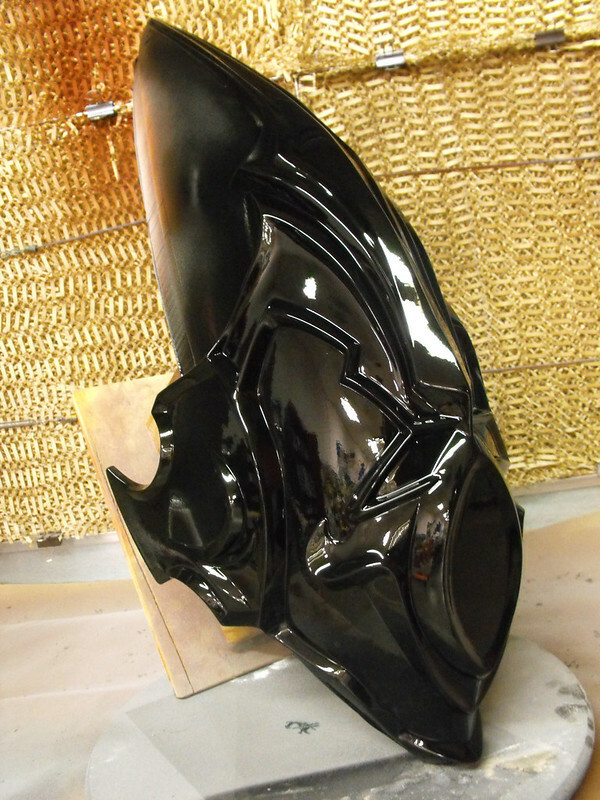 …then primer, then shiny black. Starting to see a trend here! 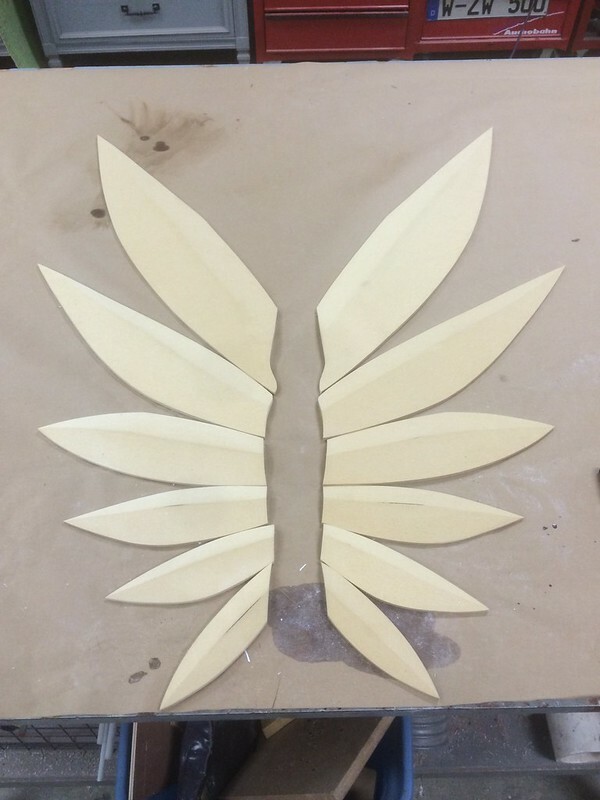 The feather holders for the wings are vertically symmetrical so I only needed to sculpt and mold one version which could be used for both sides. 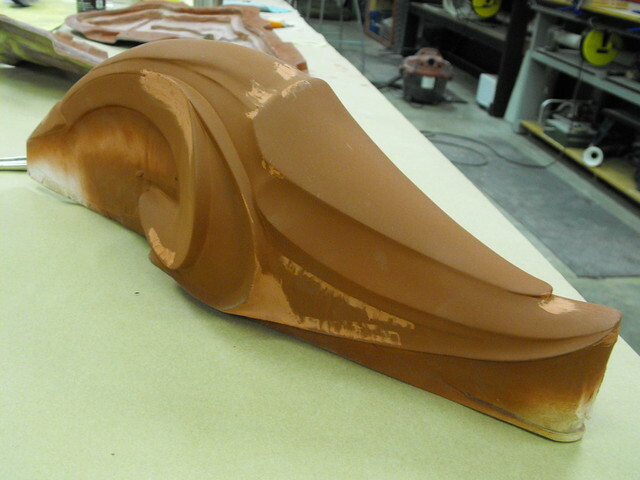 Sintra sheeting was used for the base internal form and to give the part it’s needed thickness. 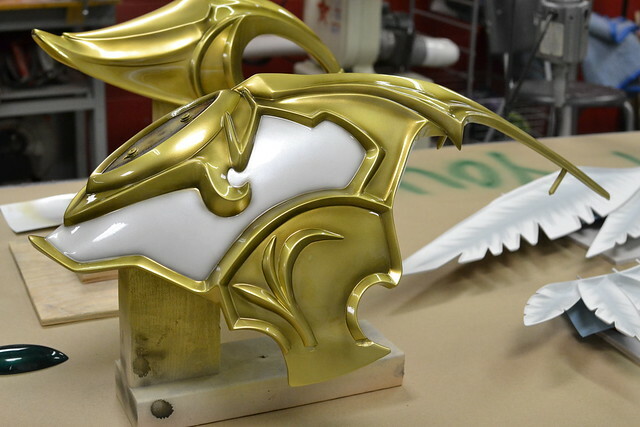 A vacuum formed foam puck created the round centerpiece for both sides of the feather mount… then, more Apoxie Sculpt (I swear I’m not sponsored by Aves) for the filigree. 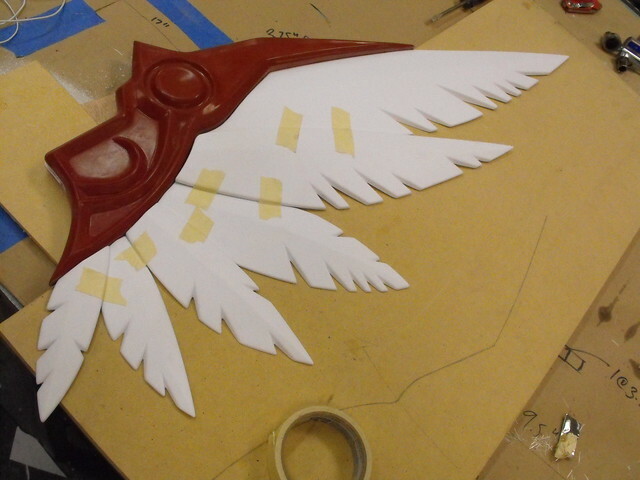 The last component were the enormous feathers that make up both wings. The smallest one is 6″ long and the largest is over 30″ from tip to base. 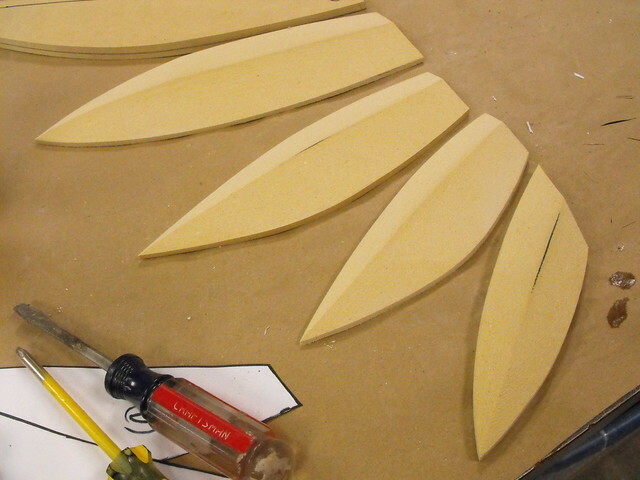 Each feather was individually trimmed out of a sheet of 3/4″ MDF. 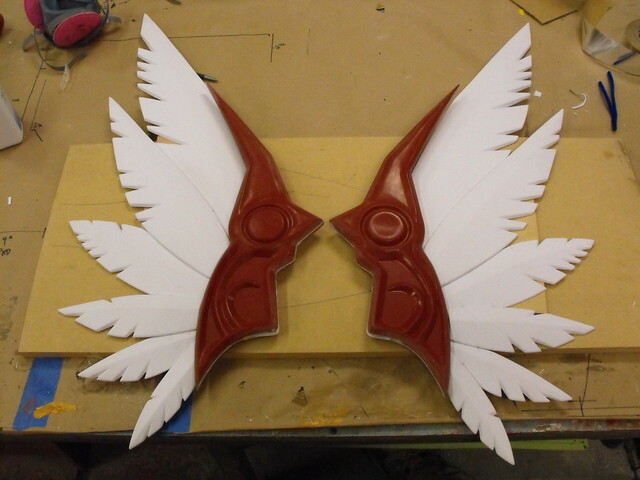 I needed to do this twice as the feathers are mirrored, not symmetrical. 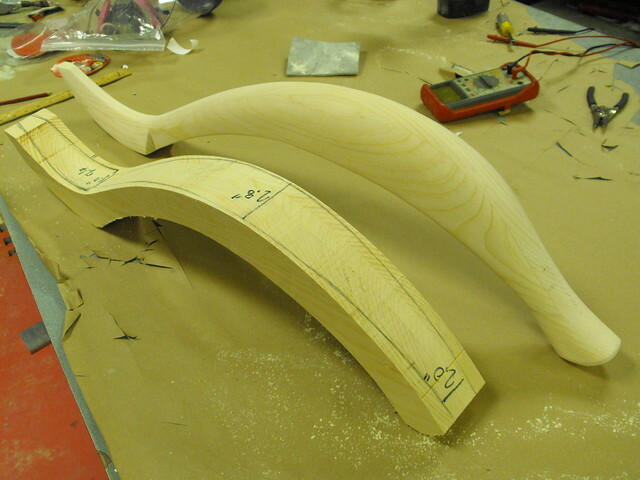 Each form was then beveled on my belt sander to create a peak. 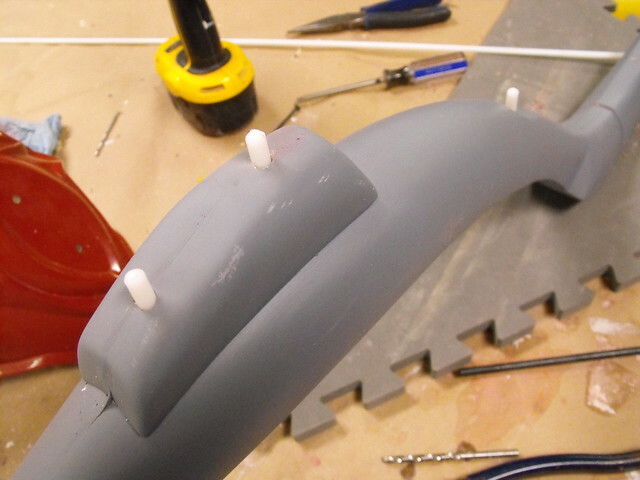 This would give the eventual vacuum formed copy added rigidity but also make the cast parts look more visually interesting as well. 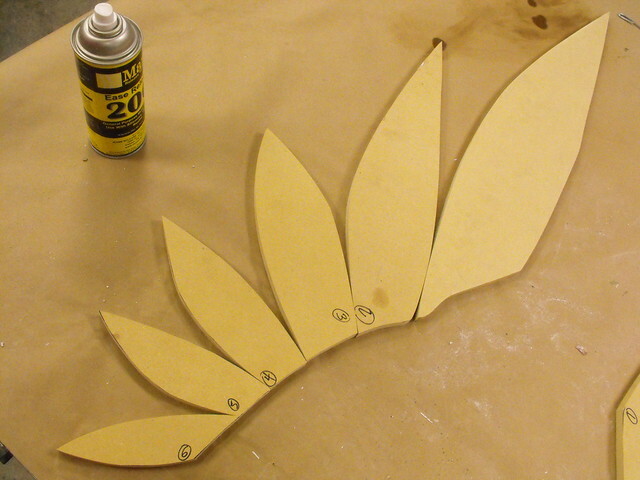 Beveled cuts in the feather bucks were added with a scroll saw to simulate the chunky breaks in the feathers represented in the game. 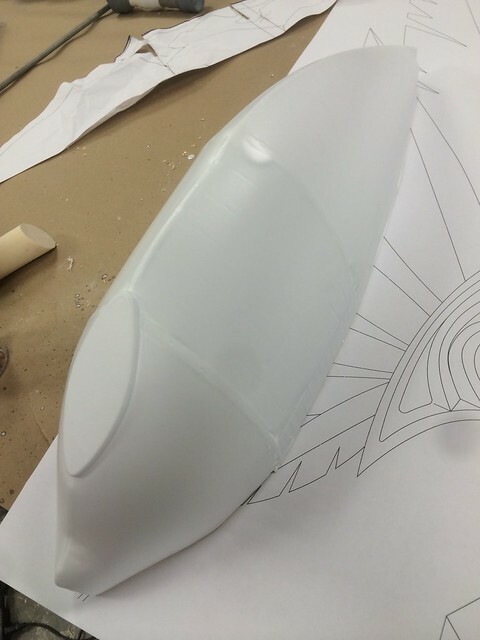 The beveled edge makes sure the forms are easily removed from the styrene after vac forming. 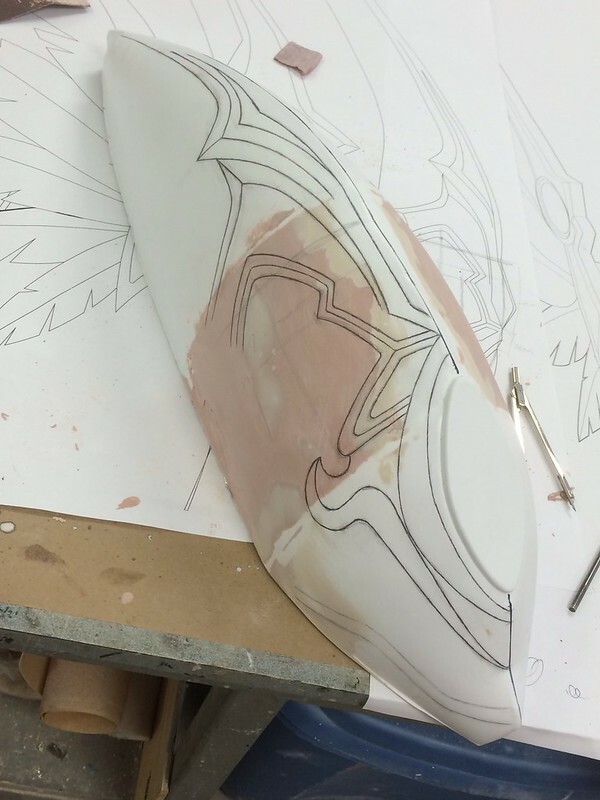 One sheet nets one wing, then each set was trimmed out and layered according to the order of the feathers in the game render. Here are the two sets after glue and assembly. 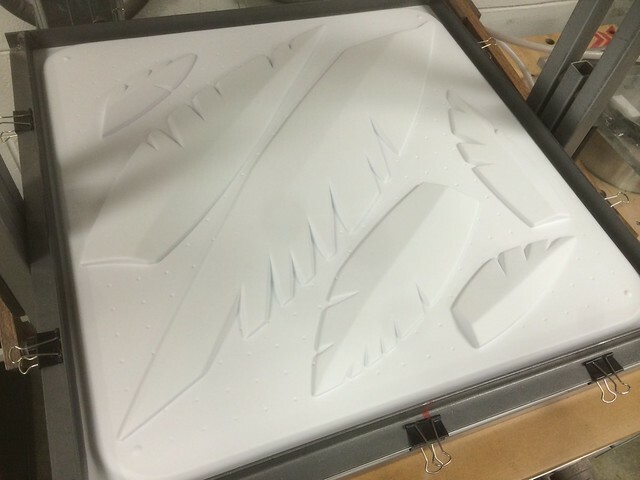 These aren’t affixed to the cast wing holders quite yet. That’s it for the mold masters! 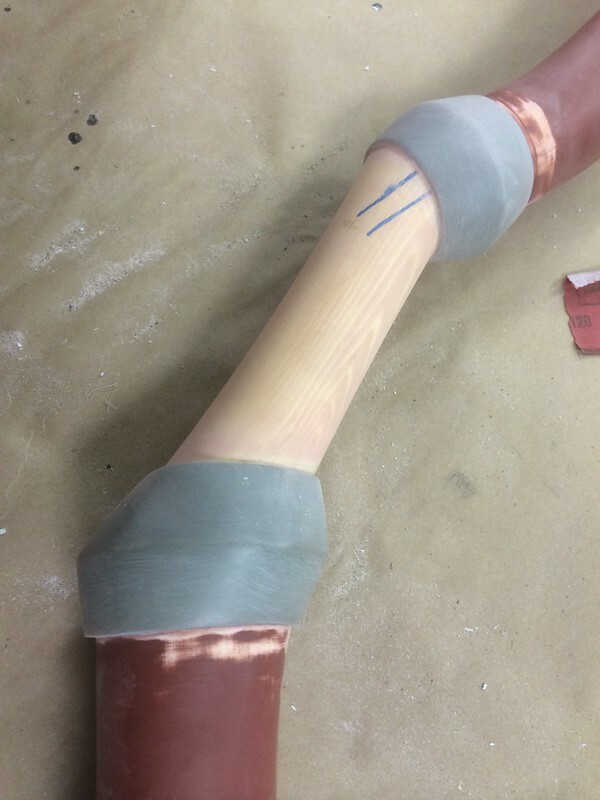 This is an insanely abbreviated version of the work that went into making these forms ready for silicone, but I get the feeling people won’t sit through the novel that this project would need in order to explain every step fully. If you’re after more information and detail, be sure to check out my Flickr page about the project right here. 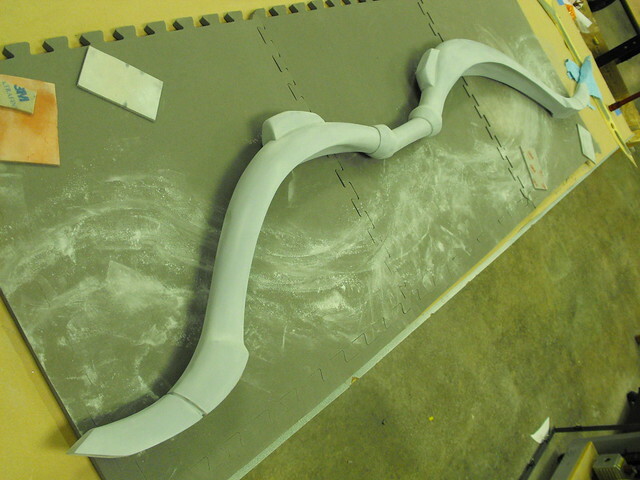 The upcoming part 2 will cover mold making, paint and assembly. Be prepared, that entry will probably be longer than this one. All of the products listed in this write up are the products that I used and can recommend. Some of them are provided as Amazon affiliate links, which help support Volpin Props.